Perfect for meal-prep ahead of time, this recipe can be enjoyed by itself or with a variety of other dishes. Add a cup of couscous to a bowl with the paprika, cumin and vegetable stock. Stir through. Pour over boiling water from a kettle until a thumb-width above the couscous. Cover with a plate and leave to steam. Meanwhile, half the olives, and chop the cucumber, red pepper and spring onions. Drain and rinse the chickpeas. After around 5 minutes check on the couscous (you’ll know the couscous is ready when all the water has been absorbed). Fluff up with a fork. Leave to cool for 5 minutes, stirring to release the steam. Mix all the ingredients together, including the juice of the lemon, balsamic vinegar and season with salt and pepper. No microwave or oven is required for this simple recipe. All you need is a kettle! 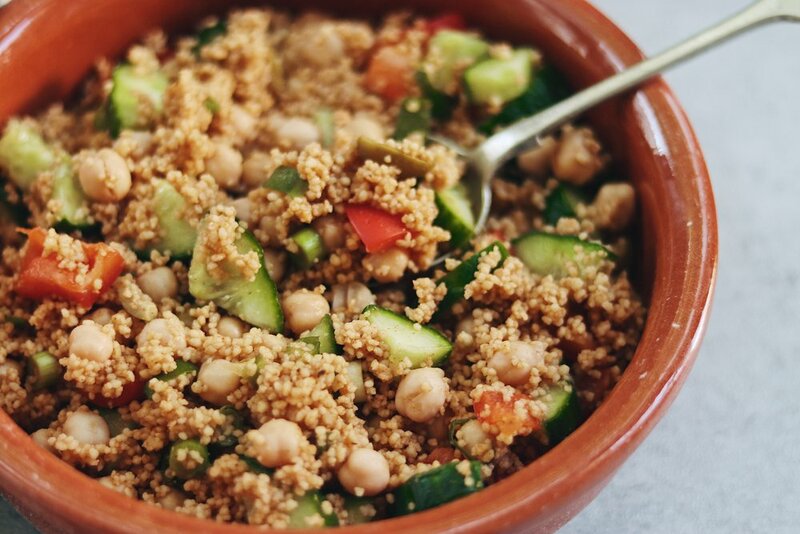 My favourite way to eat couscous is as a side to veggie burgers, some salad leaves and hummus. This recipe is a total of £1.82, making it only 91p per serving.